A French millionaire of Algerian origin, known for his fierce opposition to anti-veil laws in Europe, has been fined by police in Austria for covering his face with a picture of Foreign Minister Sebastian Kurz, adorned with €100 bills and a pumpkin mask. The businessman-turned-political activist, Rachid Nekkaz, staged the protest in front of a government building in Vienna on Monday. 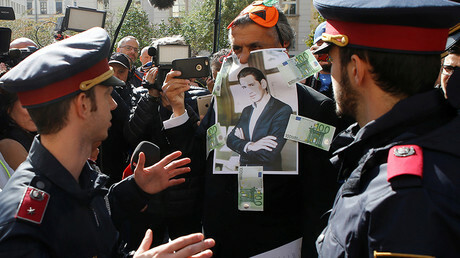 The banknotes and a portrait of Austria’a foreign minister, who is a key supporter of the so-called “burqa ban,” were attached to Nekkaz’s body, partly covering his face. The activist apparently had to tear at least one of the bills off his body later, as he was fined €50, AP reported, citing the police. In September, the millionaire made headlines by calling on Muslim women in Europe to defy the face-covering ban. Nekkaz has promised them he “will always be there and pay the fines.” Having previously established an organization to settle such bills in several European countries, the businessman has already reportedly paid some €300,000 ($ 360,000) to cover face-veil fines.